You can find various types of popular inflatable products from Beston Co., Ltd.: inflatable slides, inflatable bouncers, inflatable jumper, inflatable castles, inflatable toys, inflatable sports, inflatable games, inflatable obstacles, inflatable advertising, etc. 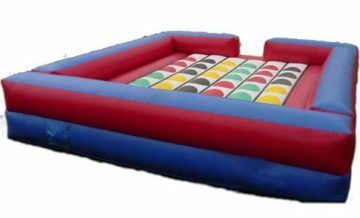 Beston is the lead of Inflatable Games field and also other inflatables. And Beston has won high praise by the customers all over the world. After winter, many kids and adults are looking forward to the summer. In summer, they can experience the fun and the cold slides, jumpers, good tunes and pool time. Now, another games will be added to your entertainment plan: the inflatable twister game. Among all the inflatable sports games, the inflatable twisters are one of the most interesting and popular inflatables. The game makes you and your children playing on the giant inflatable twister mattress instead of on your conventionally uncomfortable floor based twister. And the inflatable twister game takes this traditional floor game to a new level. The bouncy playing area of outdoor twister game is 4.5m by 4.5m, which can accommodate up to 10 twisting participants. It also comes with a 3 foot wheel to instruct players of what appendage to put on what color. That would make for 40 hands and feet stretching, clawing their way onto one of 64 colored dots. Sounds rather chaotic. The inflatable twisters cradle you and bounce when you twist, tumble, and fall. And lots of fun. Everyone can have fun with the inflatable twister. Besides, the inflatable twister is a great backyard game and works well with church, corporate, and school outings. 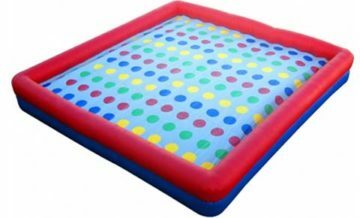 Beston inflatable twister for sale is manufactured with double-stitched vinyl and mainly includes dice, spinner board, and instructions. 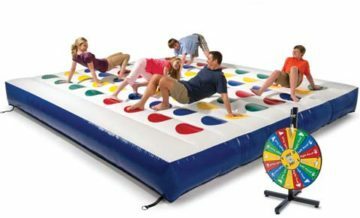 The inflatable twister game is sure to spice up the birthday party, block party, work party, or other relaxed activities. Are you looking for the inflatable twister for sale with the lowest price and highest quality? Then you can click here and know more information about the inflatable twister games and other inflatable products from Beston. We will be very happy to help you choose the most suitable inflatables for you!